The Skinny: While only average in terms of story, this Shaw Brothers wuxia yarn is loaded with satisfying action sequences, too-cool wuxia iconography, and more than enough bright red blood to satiate genre fans. Directed by Ching Siu-Tung's dad. Flying people, chivalrous swordsmen and buckets of bright red blood are provided in sizable doses in The Twelve Gold Medallions, a Shaw Brothers epic directed by Ching Siu-Tung's father. While the film features a none-too-special wuxia storyline, the fine pacing, abundance of action, and familiar kung-fu flick trappings make this an enjoyable dose of retro fun. Yueh Hua stars as Miao Lung, an honorable swordsman during Sung Dynasty-era China who makes it his personal quest to intercept twelve gold medallions from reaching their intended destination. The medallions are actually messages to General Yao Fei that instruct he and his followers to cease their resistance to a Tartar invasion. Unfortunately, said medallions are being sent by Prime Minister Qin Hui, who's actually a traitor, so any patriot would like to see the medallions intercepted and destroyed. Miao has some initial success with his goal, managing to snag three of the twelve medallions in some well-staged kung-fu standoffs. Unfortunately there's a wrinkle: Miao Lung's former master, Jin Yantang (Ching Miu), has been charged with delivering the medallions, and he delights at his newfound power. He and Miao Lung become enemies, which creates even further problems for Jin Suo (Chin Ping), Jin Yantang's daughter and Miao Lung's intended bride. Miao Lung rejects Jin Suo to spite her father, which sends her into an extremely annoyed state. Unfortunately for Yantang, Jin Suo shares Miao Lung's patriotism, and works against her father secretly. Familiar kung-fu flick iconography fills The Twelve Medallions, which greatly enhances the film's enjoyment factor. Miao Lung is a powerfully skilled swordsman whose righteous attitude and sometimes too-cool confidence make him a winning wuxia hero. The action (in part choreographed by some guy named Sammo Hung) does its best to hide actual contact between steel and flesh, but the resulting splashes of acrylic paint-looking blood compensate nicely. Nifty wirework and some surprisingly brutal sequences make the kung-fu sequences funand speaking of action sequences, there are quite a few. The film only pauses occasionally for exposition, the main detractor being the father-daughter-boyfriend angle, a plotline that seems more obligatory than affecting. The conflicts seem inherently wrenching, but any hints at emotional complexity are subdued for the majority of the picture. 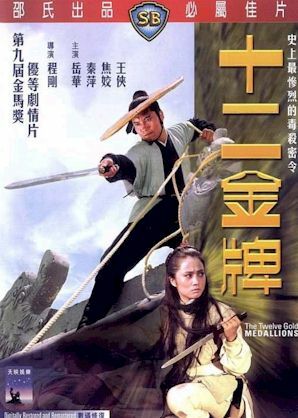 Those who found the sweeping emotions of Crouching Tiger Hidden Dragon compelling will likely not be drawn to the workman-like plot of The Twelve Medallions.